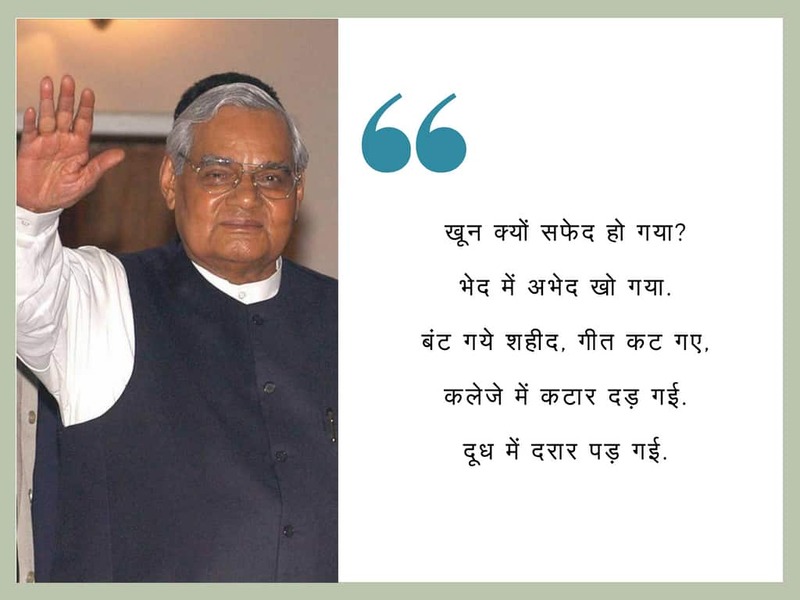 A remarkable orator, a voracious reader, a prolific poet, former prime minister Atal Bihari Vajpayee had a identity beyond the political sphere too. Be it his followers or his opposition, people used to line up and wait for hours to hear him speak. His love for poetly is no hidden secret. His words were a reflection of the life around him. 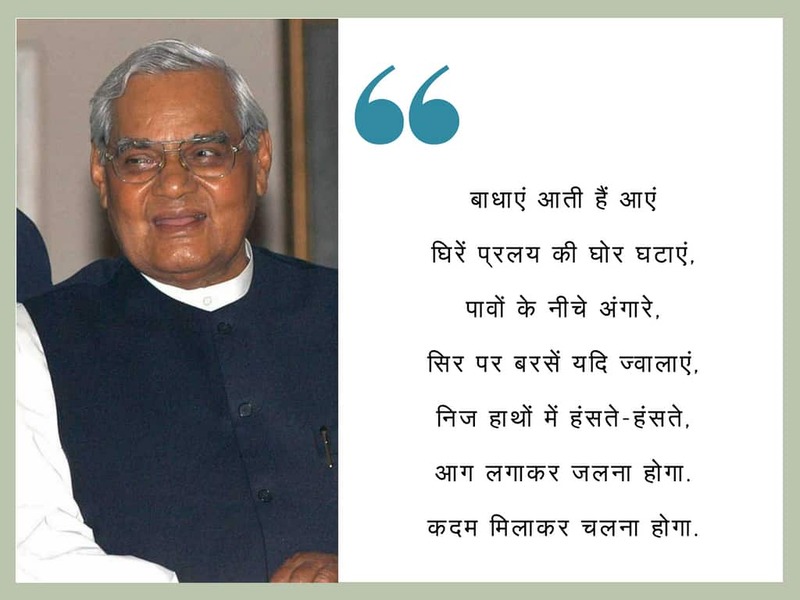 From 'Kaidi Kaviraj Ki Kundalian' which he wrote when he was jailed during Emergency to "Amar Aag Hai" which was a collection of poems published in 1994, his work has been widely admired by all. Vajpayee was educated at Victoria College (now Laxmibai College) in Gwalior and DAV College Kanpur, Uttar Pradesh. He holds an MA in Political Science and has many literary, artistic and scientific accomplishments to his credit. He edited a Hindi monthly Rashtradharma, Hindi weekly Panchjanya and the dailies Swadesh and Veer Arjun. 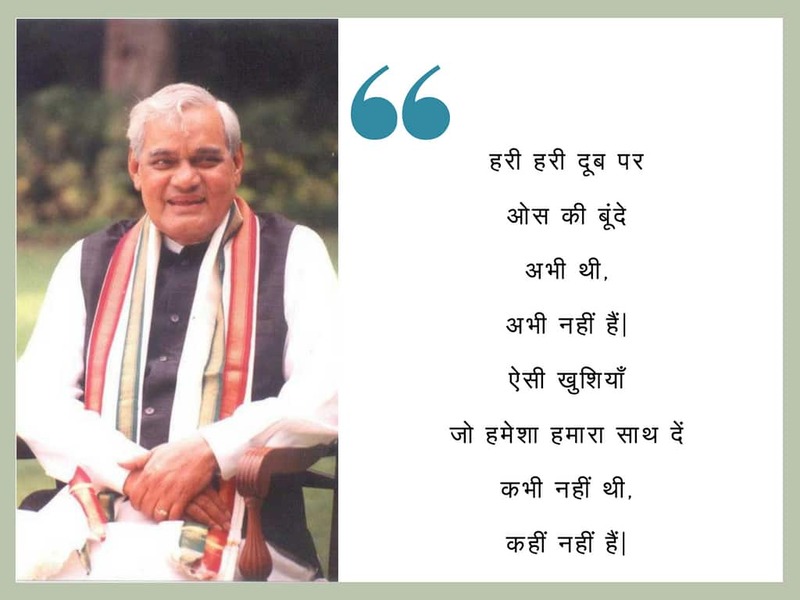 His published works include "Meri Sansadiya Yatra" (in four volumes), "Meri Ikkyavan Kavitayen", "Sankalp Kaal", "Shakti-se-Shanti", "Four Decades in Parliament" (speeches in three volumes), 1957-95, "Lok Sabha Mein Atalji" (a collection of speeches); Mrityu Ya Hatya", "Amar Balidan", "Kaidi Kaviraj Ki Kundalian" (a collection of poems written in jail during Emergency); "New Dimensions of India's Foreign Policy" (a collection of speeches delivered as External Affairs Minister during 1977-79); "Jan Sangh Aur Mussalman"; "Sansad Mein Teen Dashak" (Hindi) (speeches in Parliament, 1957-1992, three volumes); and "Amar Aag Hai" (a collection of poems, 1994). Vajpayee participated in the freedom struggle and went to jail in 1942. He was detained during Emergency in 1975-77. He was awarded Padma Vibhushan in 1992 in recognition of his services to the nation. He was also honoured with the Lokmanya Tilak Puruskar and the Bharat Ratna Pt. Govind Ballabh Pant Award for the Best Parliamentarian in 1994. 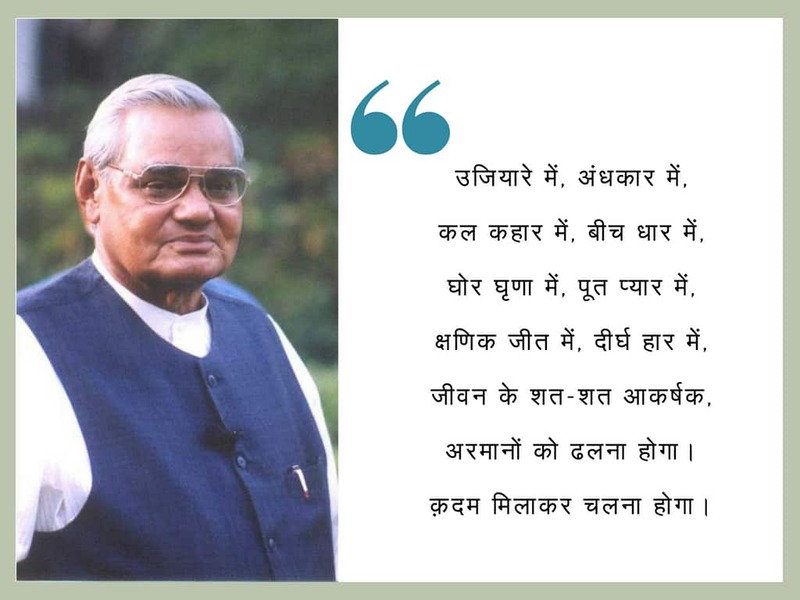 He was born on December 25, 1924 in Gwalior in Madhya Pradesh. He has been a Member of Parliament since 1957. He was elected to the 5th, 6th and 7th Lok Sabha and again to the 10th, 11th 12th and 13th Lok Sabha and to Rajya Sabha in 1962 and 1986. In 2004, he was to Parliament from Lucknow in Uttar Pradesh for the fifth time consecutively. He is the only parliamentarian elected from four different States at different times - UP, Gujarat, MP and Delhi. 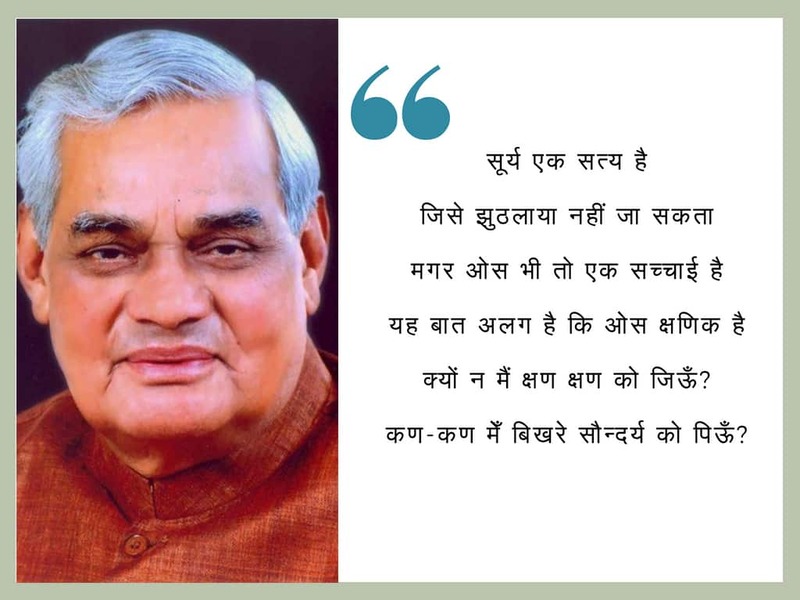 He was the Prime Minister from May 16-31, 1996, and then again from March 19, 1998 to May 13, 2004. 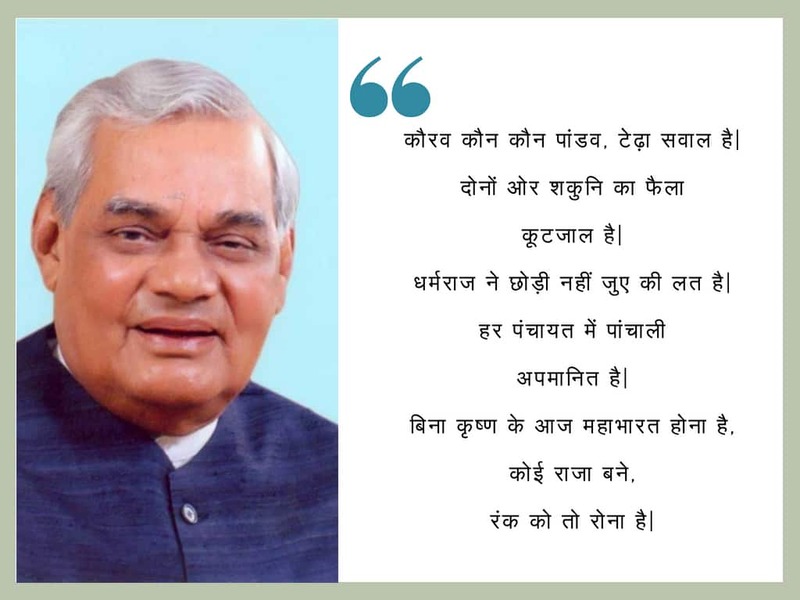 With his swearing-in as Prime Minister after the parliamentary election of October 1999, he became the first and only person since Jawaharlal Nehru to occupy the office of the Prime Minister of India through three successive Lok Sabhas. He was the first Prime Minister since Indira Gandhi to lead his party to victory in successive elections.